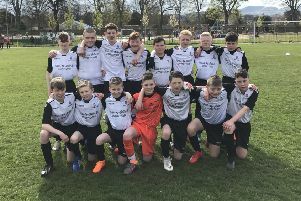 Leith Athletic came close to exacting revenge on Central Taxis Conference A leaders Newtongrange Star as they were denied all three points at the death in a 2-2 draw at New Victoria Park last night. Just over six weeks ago, Leith were thumped 9-1 by Stevie McLeish’s men at the same venue in Football Nation Qualifying Cup action, but Steven Chalmers’ side demonstrated how far they have come as only two late home goals denied them a surprise victory. Leith had led 2-0 until the 85th minute thanks to a Cameron Ross double and had missed a first-half penalty after home keeper Kieron Renton saved. However, a Dale O’Hara spot-kick and a last-minute strike from George Hunter – his 16th goal of the campaign – salvaged a point for Star. Musselburgh Athletic made it four wins out of four in Conference A as they returned from the Borders with all three points in a 4-0 success over Hawick Royal Albert. Striker Matti King hit a double for his ninth and tenth goals of the season either side of the interval. David Maskrey and Michael Deland were also on the scoresheet for Calvin Shand’s men, who host Penicuik Athletic on Saturday. In tonight’s action, Penicuik will be aiming to maintain their 100 per-cent start to their Conference A league campaign when they entertain Tweedmouth Rangers at Penicuik Park after Johnny Harvey’s side crushed Leith Athletic 8-0 last weekend. Dunbar United entertain Coldstream at New Countess Park as Geoff Jones’ squad look to bounce back from their 1-0 defeat at Hill of Beath on Saturday. In Conference B, Lothian Thistle Hutchison Vale boss Raymond Carr will see their home fixture against Burntisland as a must-win as they bid to get themselves up the table, while Tynecastle host Tranent in an intriguing clash under the lights at Meggetland and Haddington Athletic visit Sauchie. Conference C sees top-of-the-table Broxburn Athletic welcome Inverkeithing Hillfield Swifts to Albyn Park, while Linlithgow Rose – who yesterday revealed they will take on a Hearts XI on Tuesday, October 23 to mark the installation of new floodlights at Prestonfield – host Craigroyston.